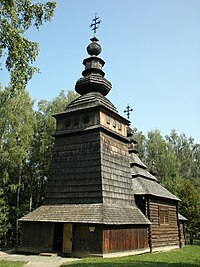 Saint Olga (Church Slavonic: Ольга, Old Norse: Helga; died 969 AD in Kiev) was a regent of Kievan Rus' for her son Svyatoslav from 945 until 960. She is known for her obliteration of the Drevlians, a tribe that had killed her husband Igor of Kiev. Even though it would be her grandson Vladimir that would convert the entire nation to Christianity, her efforts to spread Christianity through the Rus’ earned Olga veneration as a saint. While her birthdate is unknown, it could be as early as AD 890 and as late as 5 June 925. 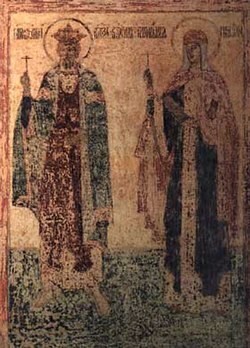 Saint Olga, who was the first Rus saint of the Orthodox Church, is the patron of widows and converts. According to the Primary Chronicle, Olga was reportedly from Pskov. The Primary Chronicle gives 879 as her date of birth, which is unlikely, given the birth of her only son probably some 65 years after that date. She married the future Igor of Kiev arguably in 903, but perhaps as early as 901-902. Princess Olga meets the body of her husband. A sketch by Vasily Surikov. After Igor's death in 945, Olga ruled Kievan Rus as regent on behalf of their son Svyatoslav. In 947, Princess Olga launched a punitive expedition against the tribal elites between the Luga and the Msta River. Following this successful campaign, a number of forts were erected at Olga’s orders. One of them is supposed to be Gorodets in the Luga region, a fortification dated to the middle of the 10th century. Because of its isolated location, Gorodets does not seem to have been in any way associated with the pre-existing settlement pattern. Moreover, the fort produced another example of square timber frames designed to consolidate the rampart that was seen at Rurikovo Gorodische. The same building technique was in use a century later in the Novgorod fortifications. Olga remained regent ruler of Kievan Rus with the support of the army and her people. She changed the system of tribute gathering (poliudie) in the first legal reform recorded in Eastern Europe. She continued to evade proposals of marriage, defended the city during the Siege of Kiev in 968, and saved the power of the throne for her son. The following account is taken from the Primary Chronicle. Princess Olga was the wife of Igor of Kiev, who was killed by the Drevlians. At the time of her husband's death, their son Svyatoslav was three years old, making Olga the official ruler of Kievan Rus' until he reached adulthood. The Drevlians wanted Olga to marry their Prince Mal, making him the ruler of Kievan Rus', but Olga was determined to remain in power and preserve it for her son. The Drevlians sent twenty of their best men to persuade Olga to marry their Prince Mal and give up her rule of Kievan Rus'. She had them buried alive. Then she sent word to Prince Mal that she accepted the proposal, but required their most distinguished men to accompany her on the journey in order for her people to accept the offer of marriage. The Drevlians sent the best men who governed their land. Upon their arrival, she offered them a warm welcome and an invitation to clean up after their long journey in a bathhouse. After they entered, she locked the doors and set fire to the building, burning them alive. With the best and wisest men out of the way, she planned to destroy the remaining Drevlians. She invited them to a funeral feast so she could mourn over her husband's grave. Her servants waited on them, and after the Drevlians were drunk, Olga's soldiers killed over 5,000 of them. She then placed the city under siege. She asked for three pigeons and three sparrows from each house; she claimed she did not want to burden the villagers any further after the siege. They were happy to comply with the request. Now Olga gave to each soldier in her army a pigeon or a sparrow, and ordered them to attach by thread to each bird a piece of sulfur bound with small pieces of cloth. When night fell, Olga bade her soldiers release the pigeons and the sparrows. So the birds flew to their nests, the pigeons to the cotes, and the sparrows under the eaves. The dove-cotes, the coops, the porches, and the haymows were set on fire. There was not a house that was not consumed, and it was impossible to extinguish the flames because all the houses caught on fire at once. The people fled from the city, and Olga ordered her soldiers to catch them. Thus she took the city and burned it, and captured the elders of the city. Some of the other captives she killed, while some she gave as slaves to her followers. The remnant she left to pay tribute. According to Clements, the story is most likely a myth. Seven Latin sources document Olga's embassy to Holy Roman Emperor Otto I in 959. The continuation of Regino of Prüm mentions that the envoys requested the emperor to appoint a bishop and priests for their nation. The chronicler accuses the envoys of lies, commenting that their trick was not exposed until later. Thietmar of Merseburg says that the first archbishop of Magdeburg, Saint Adalbert of Magdeburg, before being promoted to this high rank, was sent by Emperor Otto to the country of the Rus' (Rusciae) as a simple bishop but was expelled by pagan allies of Svyatoslav I. The same data is repeated in the annals of Quedlinburg and Hildesheim. Olga was the first ruler of Rus' to convert to Christianity, done in either 945 or 957. The ceremonies of her formal reception in Constantinople were detailed by Emperor Constantine VII in his book De Ceremoniis. Following her baptism, Olga took the Christian name Yelena, after the reigning Empress Helena Lekapene. The Slavonic chronicles add apocryphal details to the account of her baptism, such as the story of how she charmed and "outwitted" Constantine and spurned his proposals of marriage. In actuality, at the time of her baptism, Olga was possibly an old woman, while Constantine already had a wife. Olga was one of the first people of Rus' to be proclaimed a saint for her efforts to spread Christianity throughout the country. Because of her proselytizing influence, the Eastern Orthodox Church, the Ruthenian Greek Catholic Church, and the Ukrainian Greek Catholic Church call Saint Olga by the honorific Isapóstolos, "Equal to the Apostles". She is also a saint in the Roman Catholic Church. However, she failed to convert Svyatoslav, and it was left to Vladimir I, her grandson and pupil, to make Christianity the lasting state religion. During her son's prolonged military campaigns, she remained in charge of Kiev, residing in the castle of Vyshgorod with her grandsons. She died in 969, soon after the Pechenegs' siege of the city. Due to the imperfect transliteration between the Ukrainian and the English, the name Olga is synonymous with Olha. Because of her Varangian origin, she also is known in Old Norse as Saint Helga. ^ "Princess Olga of Kiev". Russiapedia. Retrieved 18 May 2016. ^ a b britannica.com: "St. Olga – RUSSIAN SAINT AND REGENT"
^ a b c d e Clements 2012, p. 7. ^ mhs.mb.ca: "Historic Sites of Manitoba: Sts. Vladimir and Olga Ukrainian Catholic Cathedral and Parish Hall (115 McGregor Street, Winnipeg)"
^ mhs.mb.ca: "Historic Sites of Manitoba: St. Vladimir and Olga Ukrainian Catholic Church (Valley River, RM of Dauphin)"
Clements, Barbara Evans (2012). A History of Women in Russia: From Earliest Times to the Present. Indiana University Press. Wikimedia Commons has media related to Olga of Kiev. This page was last edited on 23 April 2019, at 01:29 (UTC).